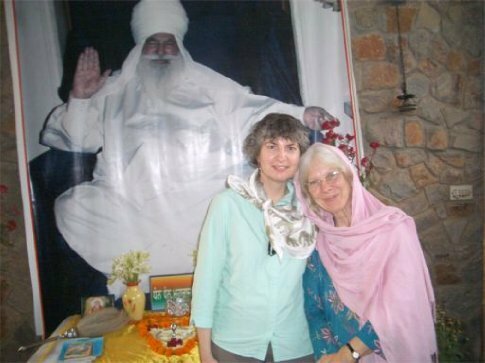 On this day I had the opportunity to visit the aunt of my friend and colleague Mike, Mary Pat Fisher of Gobind Sadan Institute for Advanced Study of Comparative Religion. Gobind Sadan is a spiritual place encompassing lessons of love from all religions. Mary gave me a tour of the Institute’s shrines to Jesus, Buddha, Judaism, Krishna, and Hanuman, their mosque, their large Sikh complex capable of accommodating 5,000 people, and a sacred fire temple according to ancient Indian tradition. There, Mary led a ritual involving blessing of offerings before placing bits of them in the sacred fire. The bananas were especially dramatic – Mary chopped an entire bunch in half with one blow of a machete. The remaining offerings of chapatis (flat bread), jaggery (sugary mix), yellow sweets, and bananas are shared among the worshippers afterwards. Delicious nap in a cool quiet room of the guest house followed by a tasty lunch of eggplant, potatoes, yogurt, salad, and chapatis, enjoyed with three women visiting from Russia. Thanks to our interpreters on a project from a few years ago, I managed a very few words in Russian. Intimate chat with Mary, then she let me help out in the office, typing a couple of pages for a children’s version of one of the institute’s books. I also became the proud bearer of an envelope full of Indian children’s art being sent in exchange for a similar envelope received from Mary’s daughter’s pupils in Maine. Savored some tea and a sweet embrace from Mary, then headed back out into the honking car horns of Delhi.